Well, the holidays are upon us and with that brings cookie baking, party going, and guests arriving. So the next few days might seem a little weird around here, as in not-too-much-blogging-going-on, but keep checking back. You might get a little surprise here and there. I am so excited about this weekend because some people we met in Switzerland who actually live in Spain are coming to visit. I always worry when new people come to visit us because we have this dog, see, and the Wonder Dog is pretty darn friendly. I'm just hoping she won't bowl them over with her "friendliness." At least she's clean--she spent the ENTIRE day at the groomer spa yesterday because her mama got the drop-off time wrong (showed up an hour early--oops!) and didn't have time to pick her up all day. Good thing she loves beeing cooped up in a cage at the PetSmart. 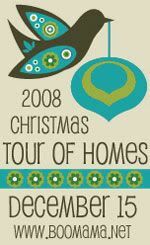 Anyway, be sure to check back in on Monday because I am taking part in Boo Mama's Annual Christmas Tour of Homes. Not that they are anything special, but I will give you a small peek into our Christmas decorations. So I'm off to eat cookies and to party with my pals. See you back here on Monday!